Antiquarian and scholar John Aubrey (1626-1697) lived during a tumultuous period in English history and spent it rubbing shoulders with some of the most celebrated writers, scientists, politicians and aristocrats of the day – among them King Charles II whom he showed around the megalithic remains at Avebury shortly after the Restoration. We can probably assume, then, that he would prefer to be remembered for something slightly more glamorous than a selection of very old holes in the ground. But it’s this ring of 56 mysterious circular cavities at Stonehenge, first discovered and recorded by Aubrey in 1666, that cause his name to echo longest and loudest through history, since they remain a subject of ongoing fascination and conjecture among scholars. A row of Aubrey holes stretching off into the distance at Stonehenge. Why did the monument's first Neolithic architect's decide to dig them? Stonehenge has existed in many different forms during its estimated 7,000 years. The Aubrey holes were most likely dug (then refilled shortly afterwards) during the earliest phases of Stonehenge, in the late fourth and early third millennium BC, well before any of the iconic standing stones were put in place. Aubrey discovered and made note of just five depressions during his studies of Stonehenge in the 17th century. No other expert paid any close attention to these finds until 1920, when Colonel William Hawley spotted and excavated another 25 holes, plus an additional seven more in 1924. It was Hawley’s assistant, Robert Newall, that named them in honour of Aubrey and his early survey. In 1950, archaeologists Stuart Piggott and Richard Atkinson dug two more Aubrey holes, bringing the total excavated to 35 (including one that Richard Colt Hoare may have encountered while digging beneath the fallen Slaughter Stone in the early nineteenth century). Another 21 have variously been located, but remain unexcavated. Numbered 1 to 56 clockwise by archaeologists from the Slaughter Stone (which was placed there after the pits were dug) at the eastern side of the north east entrance, the holes form an accurate 271.6 metre circumference circle around the interior embankment surrounding the site. They were an average of 0.76 metres deep and 1.06 metres in diameter. 25 of the pits contained later cremation burials in their upper fills, along with bone pins which may have secured leather or cloth bags used to hold the remains. Their presence makes Stonehenge Britain’s oldest cremation cemetery. The only available carbon date from the holes comes from charcoal in one of the later cremations. It gives the broad range of 2919-1519 BC. They appear to have all been refilled with freshly excavated chalk rubble soon after being dug, since little weathering has been detected on the chalk sides of the pits. Their positions are marked today at the site by white discs laid in the ground surface. What were the Aubrey holes for? Coming up with a definitive answer has proven difficult so far for numerous reasons – among them the fact that modern archaeological excavation techniques have not yet been applied to the pits, plus a shortage of accurate record keeping during the early 20th century digs and the later use of the holes for cremation purposes. The most likely-sounding suggestion is that they were postholes, dug to support wooden poles. It’s hard to determine for sure since no remains of posts have been found in the holes yet, but it may have been the case that the posts were removed rather than burnt in situ or left to rot. Numerous Neolithic timber circles existed around the British Isles (including one just two miles away at Woodhenge in Wiltshire) and Stonehenge may in its first phase have been barely different. The purpose of timber circles is unclear, although parallels were drawn with Native American totem poles by archaeologist Piggott in a 1946 BBC radio lecture. A 50 centimetre high carved wooden figure found in the Thames Marshes in 1912 and carbon dated to 2460-1980 BC has been used to tenuously support the theory. 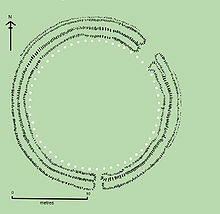 Was Stonehenge a giant "Neolthic calculator" as one archaeoastronomer has speculated on the basis of the Aubrey holes? 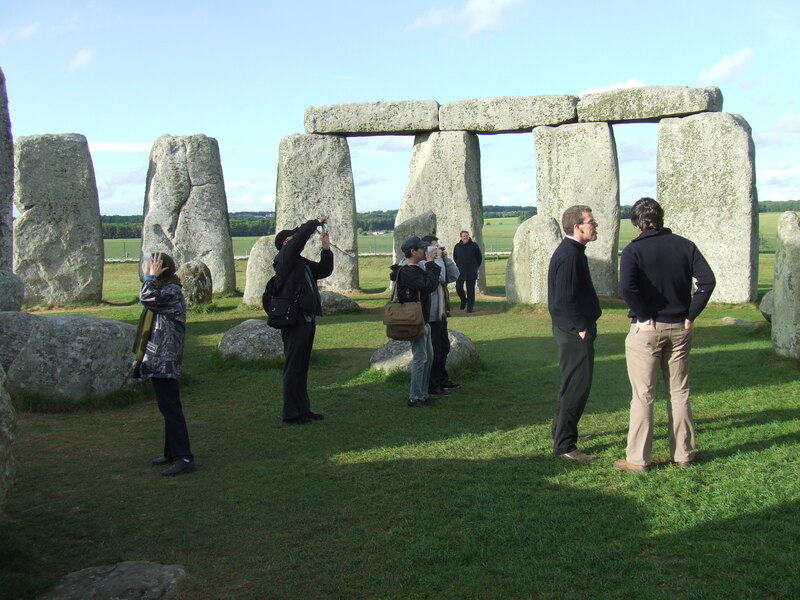 No article about Stonehenge would be complete without highlighting some far-fetched theories, most of which – when it comes to the Aubrey holes – revolve around the idea popular since the 1960s that they may have been used to hold temporary markers for astronomical observations. Gerald Hawkins, a professor of astronomy at Boston University, proposed the hypothesis in his 1965 book Stonehenge Decoded that the monument was a kind of giant “Neolithic computer” that used the holes to predict lunar eclipses by moving markers between them – a complex and romantic notion not supported by more recent archeological findings. In 1966 English astronomer Sir Fred Hoyle concluded that the 28 day lunar cycle could have been indicated by moving a marker stone representing the moon around the Aubrey holes anticlockwise by two holes every day, ending up with 56 holes in total – a more feasible suggestion than Hawkins’, but one that still assumed an incredibly high level of astronomical awareness among those who dug the depressions. Other theorists have pointed out the significance of the 28 day human menstrual cycle and argued that the holes may have been fertility indicators. 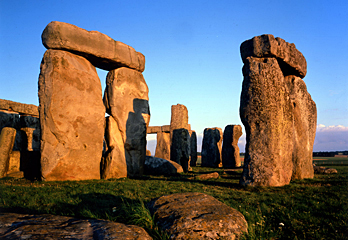 Puzzle inventor Bruce Bedlam proposed, in 2007, that Stonehenge actually once comprised a great dome-shaped building, and that the Aubrey holes were the postholes for its wooden roof frame. While the original use of the Aubrey holes is yet to be determined conclusively, recent findings by the Riverside Project – an archaeological team, led by academics from the University of Sheffield, who have been working at Stonehenge since 2003 – have shed more light on their later use as burial spots. After re-excavating one of the holes in 2008, among other locations on the site, the team was led to conclude that the long-term use of Stonehenge over the ages was principally as a cemetery and to estimate that 240 people are buried there, most of them in the Aubrey holes. With the project ongoing, further hints at the story behind these mysterious cavities may be unearthed yet. Aubrey holes picture (top) by monjujitsu; Stonhenge picture (bottom) by Rebecca Thompson. All rights reserved. Wiltshire-born antiquarian Jon Aubrey is best-known for his discovery of the holes at Stonehenge, which were named after him – the Aubrey Holes. A solitary, bookish child, as an adult he was known as charismatic and sociable, and often wrote about thoughts and opinions of the mathematicians, scientists and politicians with whom he socialised, and became an influential and passionate biographer. His first major undertaking as a historian was a publication called Wiltshire Antiquities, but he is best known for his publication Brief Lives (compiled from his notes after death), and, especially, his Monumenta Britannica. In 1666, Aubrey wrote about five circular indents in the ground at Stonehenge. His observations were ignored until, in the 1920s, Colonel William Hawley’s assistant Robert Newall identified a ring of pits, and named in honour of Aubrey. Aubrey died of an apoplexy while travelling, in June 1697, and was buried in the churchyard of St Mary Magdalene, Oxford.